By GreenEyedLillies on November 16th, 2008 . Filed under: Decorating, Gifts, Kitchen . 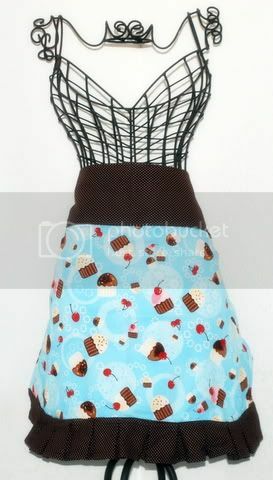 Robert Kaufman Confections Blue Cupcake Demi Apron. Simply Yummy!Edges are brown with white dots & compliment the cupcake fabric. All edges are finished and the ruffle is a pleated ruffle. Adults tie around once and double tie for children. Approx: 17 inches long. Makes adorable Hostess , Birthday, Mothers Day & Christmas Gifts! *Fits “one size fits most” Also available in Pink. Available at Bella Morgan Boutique.